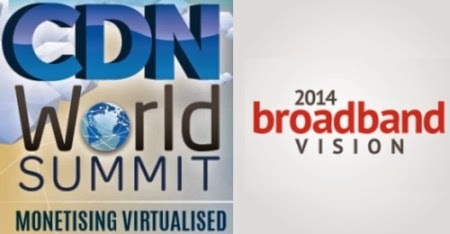 Last week, two major conferences were held over the same time period that covered multiple aspects of television: the CDN World Summit, which occurred in London, England, and the BroadbandVision Show, which took place in Las Vegas. Here, we’ll go over the major themes of both and what the primary speakers and panels had to discuss. From October 1-2 at the Thistle Marble Arch hotel, experts at the CDN World Summit enlightened attendees on a number of topics; the main focal point was “TV in the Cloud,” a much debated subject. “Cloud TV is not what you think it is: the content-as-a-service model as an enabler of innovation,” a panel discussion moderated by Executive Vice President and Managing Director of EMEA at Vubiquity, Adam Poulter. And Simon Jones, Chief TV Architect at BT TV, informed conference-goers that “there’s still some maturity work to be done” in regards to cloud-related video services. At Caesars Palace, from October 1-3, the 2014 BroadbandVision Show gathered executives from several different industries. Voice-over-IP, monetizing broadband and streaming were among the topics discussed. Like the CDN World Summit, the cloud also came up. Steve Shannon, GM of content and services at Roku, brought up the importance of integrating pay-TV with streaming services.